F. Scott Fitzgerald began work on his magnum opus, The Great Gatsby, in 1923. In 1925 it was published to mixed reviews. In its first year the book sold only 20,000 copies and Fitzgerald pocketed less than $6,000 in profit. It was not a very promising beginning. Fitzgerald had hoped was that this book would establish him as a serious, great writer. What he instead experienced was disappointment that the public didn't seem to care much for it. He blamed himself, in large part, because at the time of publication women were the primary reading audience and he had not created a likable female character with which to entice readers. In 1940 Fitzgerald died, believing that his work was going to be forgotten. The Great Gatsby received a resurgence in readers and popularity in the late 1940's, post World War II. I have to wonder if that's because people were reminiscing about the "good old days" before the war changed everything. Perhaps, wanting to go back in time, society reached back a couple of decades and tried to relax in a society that they used to know. Whatever the reason, this book became popular a few decades after its initial release and was soon integrated into the high school reading curriculum. From there, as they say, the rest is history. High schoolers everywhere have read this book. Those of us who didn't manage that (such as myself) are making up for lost time by reading it as adults. I'm really glad to say that I did not read The Great Gatsby in high school. I say that only because it would have meant that I would have to spent more years of my life regretting the fact that I'm familiar with the story. Heh. I jest. Sort of. I can't say that I cared very much for the story but, since it has been deemed a "must read" classic, I also can't say I regret getting the job done. My in-town book club agreed to read this book as several of us missed it earlier in life and wanted to play a bit of catch-up. (I am not alone!) In fact, we meet tonight to discuss the book and watch the (1974!!!) movie version. I'm doing my research ahead of time to be able to contribute more to the discussion other than, "Ugh. So glad I'm done!" A portrait of the Jazz Age in all of its decadence and excess, Gatsby captured the spirit of the author's generation and earned itself a permanent place in American mythology. Self-made, self-invented millionaire Jay Gatsby embodies some of Fitzgerald's - and his country's - most abiding obsessions: money, ambition, greed, and the promise of new beginnings. "Gatsby believed in the green light, the orgiastic future that year by year recedes before us. It eluded us then, but that's no matter--tomorrow we will run faster, stretch out our arms farther.... And one fine morning--" Gatsby's rise to glory and eventual fall from grace becomes a kind of cautionary tale about the American Dream. It's also a love story, of sorts, the narrative of Gatsby's quixotic passion for Daisy Buchanan. The pair meet five years before the novel begins, when Daisy is a legendary young Louisville beauty and Gatsby an impoverished officer. They fall in love, but while Gatsby serves overseas, Daisy marries the brutal, bullying, but extremely rich Tom Buchanan. After the war, Gatsby devotes himself blindly to the pursuit of wealth by whatever means - and to the pursuit of Daisy, which amounts to the same thing. "Her voice is full of money," Gatsby says admiringly, in one of the novel's more famous descriptions. His millions made, Gatsby buys a mansion across Long Island Sound from Daisy's patrician East Egg address, throws lavish parties, and waits for her to appear. When she does, events unfold with all the tragic inevitability of a Greek drama, with detached, cynical neighbor Nick Carraway acting as chorus throughout. Spare, elegantly plotted, and written in crystalline prose, The Great Gatsby is as perfectly satisfying as the best kind of poem. There are many themes fit for discussion in this book, which is probably why it is on many a library's recommended book club list: it's a classic and it's about doing everything wrong and nothing right in an age when anything goes. (Sound familiar? Oh yes, let's read it again!) What I do like about it is that each character who has made poor choices pays the price for their decision. This is not a happy book and I'm glad to say that. Not a single character stood up for right, or defended it. Each person is out seeking their own pleasures and they receive them, hallow and shallow though they might be. You can feel the depression each character suffers from within the first few pages (making this short book a long read). Themes present: discontent (each character suffers from this), racism (Fitzgerald believed in the supremacy of whites and that is abundantly and abhorrently clear as he references other races within these pages), marriage (no one values it), religion and truth (does God see what men cannot? ), and also wealth (and what it can afford). If you are looking for a quick explanation on any one of these themes, I found this helpful website which takes a quick peek into some of the ideas expressed in this novel. Fitzgerald was the originator of the phrase "the jazz age" which refers, of course, to the 1920's. Gatsby's estate in the book is thought to be modeled after Oheka Castle which is the second largest private estate in America, located in New York. For $595 a night you could stay in one of their Gatsby Suites! The character of Daisy Buchanan was based on a former girlfriend of Fitzgerald, Ginevra King. King came from a wealthy family and Fitzgerald did not. His relationship with her has been noted by some scholars as one of the "most important" of his life -- including even that of his wife. (Depressing.) In one of Fitzgerald's ledgers he noted that King's father once said, "Poor boys shouldn't think of marrying rich girls." Fitzgerald was named after his second cousin (three times removed! ), Frances Scott Key. 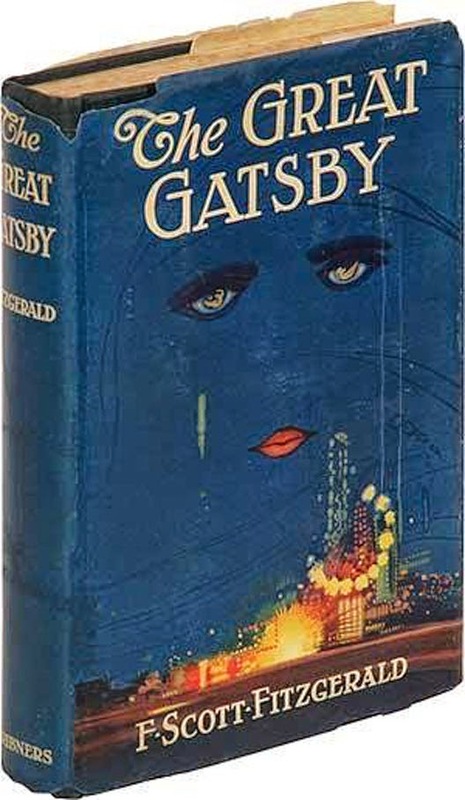 The following titles were considered for the book, prior to The Great Gatsby being decided upon: Among Ash-Heaps and Millionaires; Trimalchio; Trimalchio in West Egg; On the Road to West Egg; Under the Red, White, and Blue; Gold-Hatted Gatsby and The High-Bouncing Lover. The book first appeared on screen in 1926 as a silent film. The Fitzgeralds attended a showing but walked out of the film with his wife remarking that it was "rotten and awful and terrible." I kind of think that the book is much the same but - ! It is now considered "the great American novel." And now I can say that I have read it, which is what I wanted to be able to do. Go me. I've read this one numerous times--first as an eleventh grader and then as a teacher. I don't love it, but I don't hate it, either. (I definitely like it better than anything by Faulkner or Hemingway!). I DO think this one gets better with discussion. Good choice on the movie, too. I haven't seen the new movie (& probably won't, based on the previews I've seen), but you just salt bear Robert Redford and Mia Farrow, in my opinion. I really disliked it also. I read it in high school. I didn't get the appeal then. I'd be curious to see if I got it more as an adult, but not enough to read it again. Read it in high school. Didn't like it then. Thought that was because I was an "immature" reader. Glad to know I don't have to go back and read it. ;) Thanks for your thoughts. :-) Go you! I didn't like it either. I haven't seen any of the movies. Thank you for the review. I wasn't required to read it in high school. I tried reading it several years ago and couldn't get into it. I now know that I wouldn't enjoy it any more than I enjoyed Wuthering Heights, which I finally got through but disliked all the characters (except possibly the housekeeper who narrated most of it). I read it in high school and took my review of it to state public speaking competition. I don't remember much of the speech other than the opening line "vanity, vanity, all is vanity. " I've never read it and never been inclined to except in the "I wonder what this is all about and why people like it so much" way, but everything I've seen about it makes me further disinclined to. I'm not fond of self-destruction stories, and this doesn't sound like it has any redeeming features. I read this one in high school. All I remember about it was that I Did Not Like It. I have no intention of rereading it as an adult. Yay for getting it checked off your list! I'm bummed that so few people seem to like this novel. It's true that it is a depressing look at the human condition - but it is an accurate (in my view) depiction of the folly of setting our hearts on this earth. And it is ripe with themes for discussion.